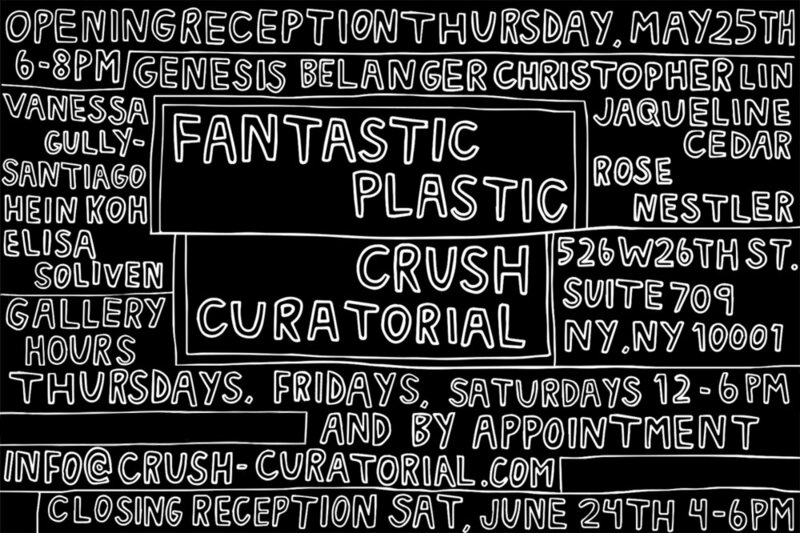 CRUSH CURATORIAL/Chelsea is pleased to present FANTASTIC PLASTIC, opening May 25, from 6 – 8 PM and running through June 24, 2017. The works in FANTASTIC PLASTIC stretch the humor in their making. They hold meaning with slippery hands and languish in pleasure as impending doom abounds. Dispassionate and stuck, sutured and tucked, these artworks drag their feet and lift their chins. The artists presented play with their own vulnerability as they reveal and make public the tearful smirk of one who finds humor in defeat. They are assertive and unapologetic in their desire to forefront sensation and sentiment. Genesis Belanger’s sculptures involve uncanny structures in which truncated and refashioned parts combine to present familiar and rejointed scenarios. Her work mines history and the everyday as she considers the potential discomfort and pleasure evoked by unusual juxtapositions and the editing and re-fixing of daily forms and operations. Jaqueline Cedar’s drawings and paintings depict figures caught in their own reflection. Having indulged in moments of self-induced reverie they find themselves stuck and unable to exit their present circumstances. Vanessa Gully-Santiago’s drawings effect numbness and want, physical contact and vacuous space. Hein Koh’s sculptural installations engage body and tactility in form and subject. She pulls from personal and fantastical content as she envisions physical constructions that evoke fetish and fear. Christopher Lin’s sculptures call upon his own body and the body of the viewer in a one-to-one fashion. The scale of the work asks for empathy and participation on the part of his audience. His sculptures draw upon our collective experience as they enunciate a desire to turn inward via a deep-mirrored gaze and detach from self through an unconscious daily shedding of bodily ephemera. Rose Nestler's sculptures build moments of structure and repose. They occupy space with mass that feels at once solid and flexible as they evoke the ins and outs of a body exposed. Innards twist and turn, synthetic forms bulge and tuck. Elisa Soliven brushes texture and color against tactile surfaces that reveal and conceal. Her faces and forms present themselves slowly from varying points of view. Curated by Jaqueline Cedar in collaboration with Karen Hesse Flatow, CRUSH CURATORIAL. Jaqueline Cedar is an artist who currently lives and works in Brooklyn, NY. In 2009 she received an MFA in painting from Columbia University. Recent and upcoming exhibitions include solo shows at Marsh Gallery, Indiana University, CRUSH CURATORIAL, Steven Zevitas Gallery, 106 Green Gallery. Press includes Huffington Post, New American Paintings, and The Boston Globe. 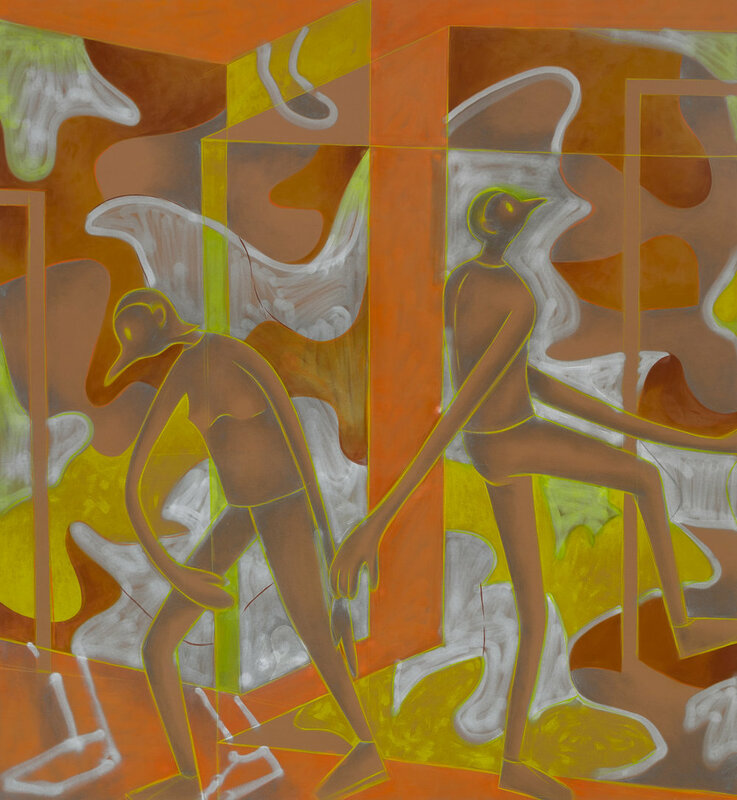 Cedar's figurative paintings and sculptures address ideas of self-awareness, control, and immobility, staging a potential but arrested movement toward knowledge or engagement.